For most of the XXth century, photographers who wished to snap a shot of the Aurora had to rely on silver-coated films and darkrooms to obtain any kind of results. Towards the end of the millennium, a new technological breakthrough made it much easier to obtain similar, and even sometimes better results: Digital Photography! If digital photography was already around in the seventies and eighties, most of the digital cameras produced during this period were mere prototypes that were not released to the public. Digital photography really started when, in the early nineties, the first commercialized digital cameras hit the market. Some of these cameras were really more novelty items than functional cameras and some could only take Black and White pictures with extremely low resolution (less than 500×500), cost dozens of thousands of dollars or only store very few shots, sometimes on floppy disks! The first really ´professional´ digital camera that would produce satisfying results comparable to its film-counterparts was the Nikon D1, released in 1999 and could boast of a relatively low price (5000 dollars) and decent image quality (almost 3000×3000 pixels). From this point on, it became clear that Digital Photography was here to stay and the first digital Northern Lights pictures would soon be taken. A Selection of some of the first Digital cameras to hit the market in the 1990s. Even though, it is pretty hard to pinpoint who,where and when the first digital Northern Lights picture was taken, the website Spaceweather.com keeps very informative online Northern Lights photo galleries from the early 2000s. By examining the galleries and the camera used it becomes clear that Northern Lights photographers progressively started using more and more digital equipment between 2000 and 2001, during a period of powerful Northern Lights activity which was the first of its kind to reach the Internet. This adaptation to digital photography isn’t surprising: with digital photography, taking Northern Lights picture had become almost easy! While previously photographers had to buy expensive film and could never be quite sure of the quality of shot until having paid a hefty sum of money to print it, digital photography made it easier and cheaper to practice the complex art of photographing the Aurora. To start with, lcd-display made it possible to get an idea of the final result immediately after taking a picture. Being able to change the ISO settings responsible for the picture’s light sensitivity was also a blessing; previously each roll of film had a specific ISO value and changing ISO meant painstakingly changing film, sometimes in the middle of a powerful Aurora display or by very cold weather! And while these early digital cameras had less sensitive image sensors than today, they could still manage taking Northern Lights picture alright. 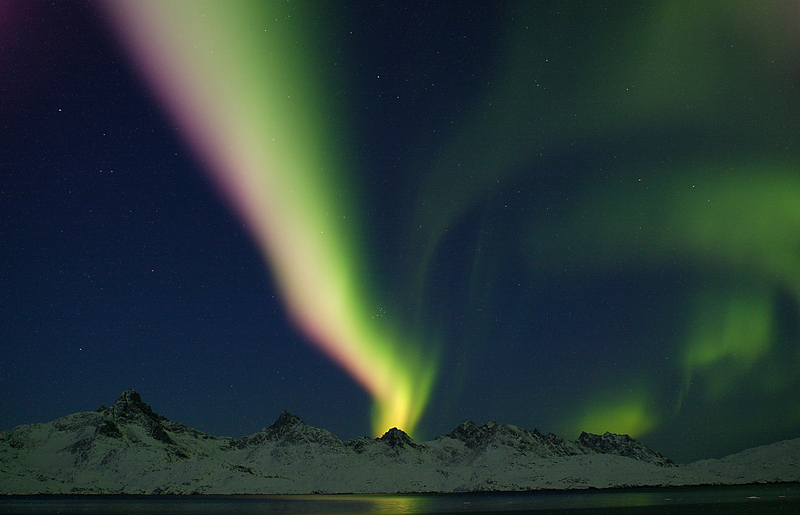 Around 2004, Digital Northern Lights Photography began to give better results than its Film counterpart. In just a few years, Film Northern Lights photography became more and more a thing of the past. Around 2003-2004, newer and better-performing digital cameras raised the bar once again and started taking objectively better Northern Lights pictures than their film counterparts. These pictures, taken more than 10 years ago might still be a tad ´grainy´ but overall, they aren’t much worse than those taken today. And if some old-school photographers still take Northern Lights picture using film cameras, in 2015 it is digital photography which is the preferred method of Northern Lights photographers the world over who feed the inter-webs with their daily dose of shimmering green and red Auroras. Yet, digital photography isn’t the end game for Northern Lights pictures as we will find soon out in the last installment of our series: Visions of the Northern Lights Pt.4: Moving Lights, Moving Pictures!